Italy's Andrea Dovizioso won the San Marino MotoGP on Sunday for the Ducati rider's third success of the season, holding off world championship leader Marc Marquez of Honda. 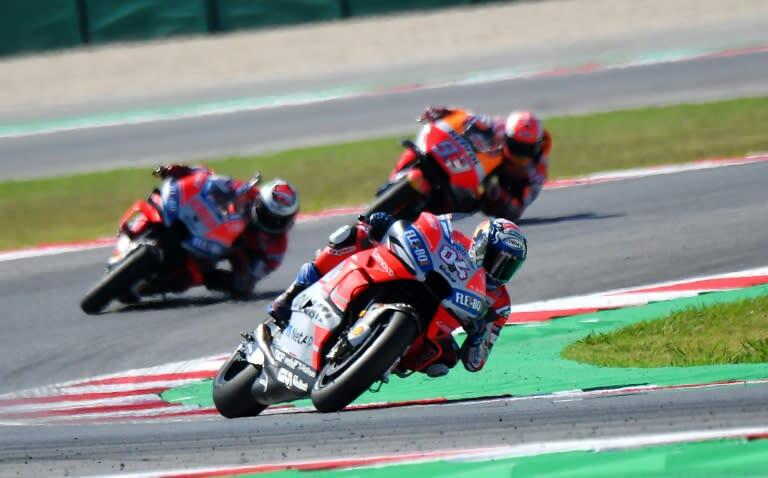 The 32-year-old Dovizioso finished 2.822sec ahead of the Spaniard on the Misano track on Italy's Adriatic coast with Britain's Cal Crutchlow snatching third for Honda after pole sitter Jorge Lorenzo of Ducati crashed with two laps to go. Four-time world champion Marquez extends his overall world championship lead to 67 points ahead of Dovizioso, who moves up two places to take second spot from Italian Valentino Rossi, who finished in seventh place. Rossi drops to third overall, with Lorenzo now in fourth. "I'm happy to have beaten Marquez and to win here where I had never manged to before," said Dovizioso, who was born 60 kilometres up the road from the Misano track. He overtook his Ducati teammate Lorezno on the sixth lap and never looked back. "It was a very difficult race. Fighting against the Ducatis is another world. I had ridden well in the warm up, but I struggled to stay with them. "I pushed to be second, I'm sorry for Jorge's fall, but we were both pushing a lot." Ducati's Jack Miller had started on the front row but crashed out with Yamaha's Maverick Vinales, also on the front row, dropping to fifth. Italy's Francesco Bagnaia, of Kalex, won the Moto2 category ahead of Miguel Oliveira of KTM, to extend his lead on the Portuguese rider to eight points in the overall standings.